Jo Adell does not have any MLB stats for the season. Draft: 2017, Los Angeles Angels, 1st rd. April 4, 2019 Mobile BayBears placed CF Jo Adell on the 7-day injured list. January 25, 2019 Los Angeles Angels invited non-roster CF Jo Adell to spring training. July 30, 2018 CF Jo Adell assigned to Mobile BayBears from Inland Empire 66ers. July 18, 2018 Inland Empire 66ers activated CF Jo Adell from the temporarily inactive list. July 12, 2018 Inland Empire 66ers placed CF Jo Adell on the temporarily inactive list. May 22, 2018 CF Jo Adell assigned to Inland Empire 66ers from Burlington Bees. May 8, 2018 Burlington Bees activated CF Jo Adell from the 7-day disabled list. April 24, 2018 Burlington Bees placed CF Jo Adell on the 7-day disabled list. April 3, 2018 CF Jo Adell assigned to Burlington Bees from Orem Owlz. 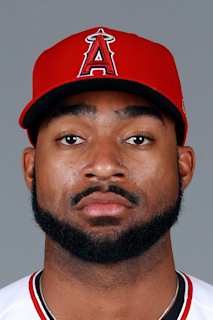 March 24, 2018 DH Jo Adell assigned to Los Angeles Angels. August 17, 2017 DH Jo Adell assigned to Orem Owlz from AZL Angels. June 23, 2017 Los Angeles Angels signed CF Jordon Adell. June 23, 2017 CF Jordon Adell assigned to AZL Angels.